This band's eponymous debut album was one of the earliest signs that Ecstatic Peace! was not a label contented with following a purely avant-garde trajectory. 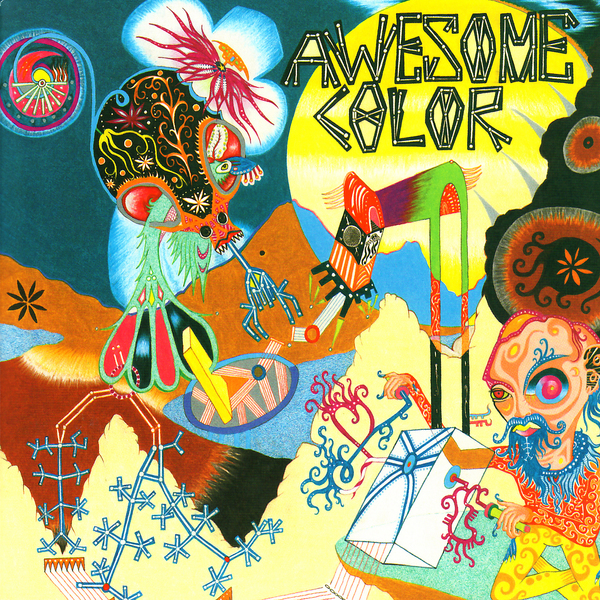 Awesome Color are first and foremost a rock & roll band, slamming down classic rock with an overwhelming roughness and brutalism curbed only by a strong grip on the art of riff writing. As raw and powerful as this band is, at times you could be listening to a Kings Of Leon album - and that's no slur: 'Already Down' could make it to one of Radio 2's more open-minded playlists, and 'Step Up' for all its leanings towards heaviness dabbles with Kiss-like stadium sounds with an air-punching authenticity. Exploring a rootsier, AOR sound, 'Come And Dance' not only taps into '70s psych, but fools around with vintage R&B (with emphasis on the B), not a million miles away from the twin furrows ploughed by Ethan Miller in Comets On Fire and Howlin' Rain. As fans of the previous Awesome Color album will already be aware, these guys have some serious chops as musicians, and that's across the board: from Allison Busch's authoritative drumming, via Michael troutman's spidery bass playing, right up to the old school soloing of guitarist/vocalist Derek Stanton. It all makes for compulsive listening, and an altogether stronger release than the band's debut.